This decidedly witty and unusual film is directed by Preston Sturges and stars Rex Harrison as the flamboyant Conductor Sir Alfred De Carter. He has asked his distant cousin, played with comic style by Rudy Valee, to keep an eye on his wife, Linda Darnell, while he is out of town. When Valee informs Harrison that he was forced to hire detectives, the Maestro initially tears up the report and banishes his cousin for subjecting his wife to the vulgarities of suspicion and the presence of lowly sleuths. But just as with Iago, the seed is planted and suspicion reigns in the Conductor's heart. While he conducts, he imagines various scenarios in which he murders his wife. When he goes to implement these plans, nothing goes right, except for the viewer. This may be one of Preston Sturges' most comical works. In my book, nothing could surpass his classic "Sullivan's Travels", but this one comes close, yet in a more mature way. The director is not trying to make any point with this film. It is evident that he is having too much fun making it. 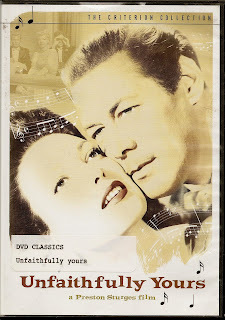 Rex Harrison plays his role with remarkable flexibilty, while Linda Darnell plays her part,as always, without a hitch. The real surprise in this film was the quick pace and sharp dialoque. Along with the aforementioned acting of Rudy Valee, this film will leave an impression upon you. Now, let's see, where is that copy of "Sullivan's Travels"....?